The first thing I did was to remove the left lens from my “good” $$$ glasses – 8 month old progressives I wear when I’m out of the house, and always when driving. That gave me something I could drive with and a sort of monovision so I could read labels etc at the store. Worked pretty well – certainly much better than with the left lens in (or with nothing). Yeah, looked kinda funny. Oh well. 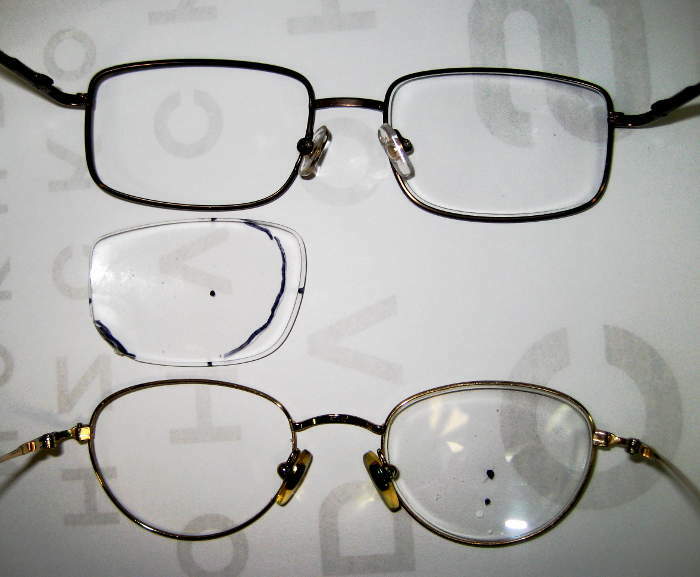 Then I took a pair of single vision “reading” glasses – maybe +2 or 2.5D from my normal distance prescription – that I use for reading/bench/computer work at maybe 13″ and removed the left lens from those. That provided a more extreme monovision for around the house that let me read (right eye) and still have some moderate distance vision – with the less-perfect-than-I’d-hoped-for left eye. I used those at the computer, but got a headache after the first extended session. I put a loose cardstock patch over the left side of the frame, and that pretty much fixed the headache. Later, and in shorter sessions, I got away without the patch. Brain may be getting over saying “WTF! ?” and just ignoring the fuzzy eye. I was a little concerned that I was teaching my brain to ignore the left eye when I used those glasses – which I did a lot. And since the left eye wasn’t great anyway, that extra training didn’t seem like a good thing. 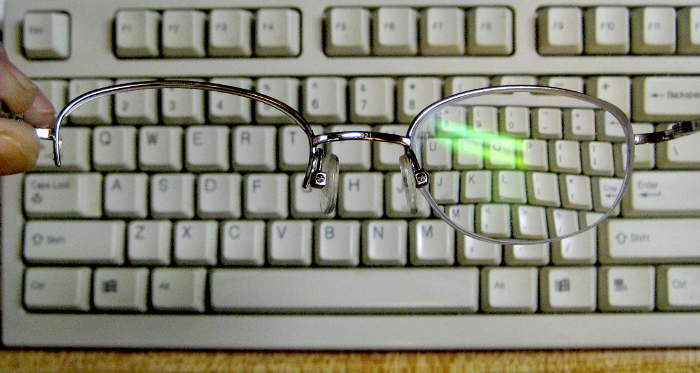 But in order for the left eye do any work at that distance, it would need a normal reader/magnifier lens. Off to Walmart. I tried a few readers, and decided +2.0D let the new left eye see about right at 13″. I chose a $6 pair with largish lenses to give me something to work with. I popped one lens out (the wrong one, as it turns out) and when I held it over the missing lens of the good old readers, it seemed to do about what I expected. Of course I’d need to set the PD correctly. The glasses I’ve gotten from Zenni were ordered with 65mm PD, but since these were for closer work, I expected my eyes to be more converged. 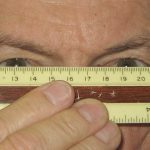 Holding a ruler up to the centers of my eyes and looking into a camera about 13″ away, I took pictures that showed a PD of ~62mm. Now I have a target. 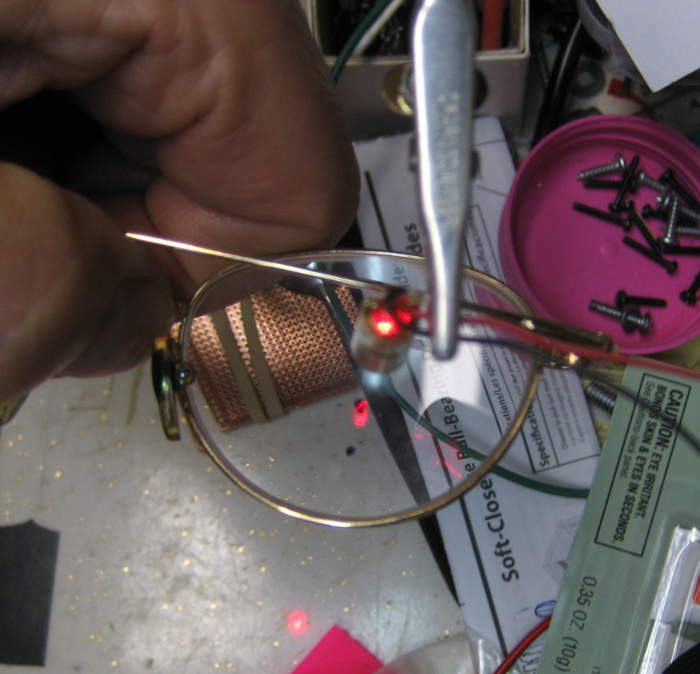 To find the optical centers of the old and new lenses, I set up a laser diode pointing down at the bench, and marked where the beam hit. Holding the lens near the laser, I moved it around so the beam hit the same spot on the bench as without the lens, and marked the spot the laser was going thru the lens with a black Sharpie. As a double check, I moved the lens around and verified that I saw the shadow of the Sharpie mark when the spot was in the undeflected place. With marks on the right lens of the glasses and the loose +2 lens, I was set for the next step. In an awkward maneuver requiring more hands than I had, I held the loose lens up to the frame and slid it back and forth so the 2 marked spots were 62mm apart according to the ruler I was holding with my left foot. With a combination of trying not to let the lens move and a mental snapshot of about where it had been when the PD was set right, I marked the outline of the frame on the lens with a Sharpie in my third hand. A double check showed the spots still about 62mm apart. Good. The lens didn’t completely fill the frame, but looked workable. So how do I cut the lens down? One corner just needed to be relieved a mm or so, so I put on safety glasses and took it tentatively to the belt sander. The acrylic lens sanded away perfectly, and it didn’t feel at all like the lens was about to shatter. I have no idea why I thought I’d know what that felt like, but I seemed to. Removing the rest of the lens down to the Sharpie outline (maybe 1/4″ in places) was quick and uneventful. I started shaping the edges so the front surface of the lens would fit into the concave inside of the frame. A few cut and try iterations, and it was ready for final fitting with a file. I rotated the lens a little to let it sit where it wanted in the places not designated for the final fitting. I think that was a good idea, and probably avoided unpleasant surprises about having removed too much. Of course since there was no astigmatism to worry about, the exact orientation of the lens didn’t matter. A couple more iterations with a file, and the lens snapped in, and has been there ever since! When I put them on, things seemed about in focus for both eyes, but the difference in magnification between the eyes was very evident in “swimming” movement when I’d turn my head. No surprise, but duly noted. I could vaguely see the center spots on the lenses, but had trouble matching them up. Turns out when I was looking straight thru the centers of the lenses, the spots were so closely superimposed that I missed them. That test passed with surprisingly flying colors. 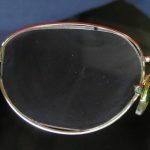 I cleaned the heavily handled lenses and took a pic showing how the new lens doesn’t fill the frame. Pretty close, though. I sat down at the computer to write up these notes (while wearing the new glasses) and the big limitation leaped out: The only way these are practically useful is when I’m looking right thru the lens centers. Image fusion suffers a LOT anywhere else. Interesting. On the comment about having removed the wrong lens from the OTC readers: I arbitrarily took the left lens out to fit into the other glasses. If I’d taken the right lens out, it would have left the option of trying those readers as near-vision monovision, with 13″ for the left eye (new IOL plus the +2 reader lens) and my naked old right eye with its 7″ working distance. Not a big deal, and fixable for another $6. Hmmm – just tried it with the new readers upside down. That worked well enough to let me see how it worked/felt – about as I expected. Interesting, though not terribly practical. Done. It’s not clear whether these will be useful or whether I’ll pop the new lens out and use them one-lensed as they started. I’ll post an update some time. But it was an interesting experiment in any event. Update a few days later: Yes, they’re useful. They served well for the week or two until the second lens replacement surgery. Success. Update 7/10/18: (This is written after the fact, and the timings of various bits were intertwined.) 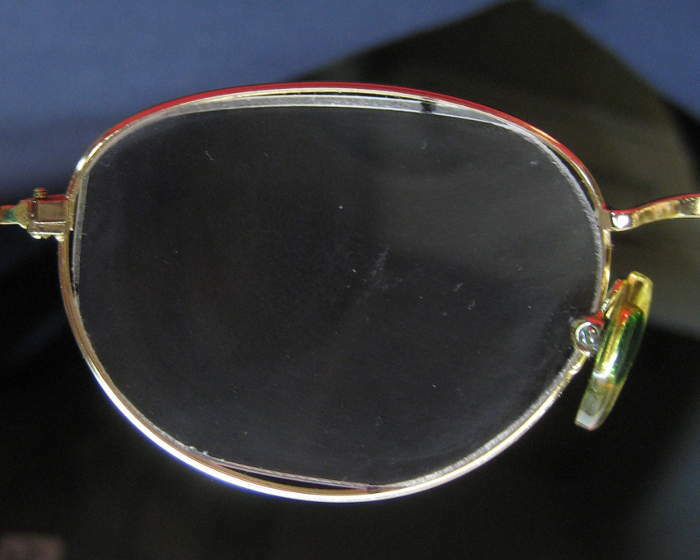 A refraction after the first replacement had shown (to the doctor’s disappointed surprise) that there was about 1.25D of astigmatism in the left eye. I couldn’t see very well (20/60?) with that eye, and assumed (incorrectly) that it was mostly due to the astigmatism, and so was anxious to correct for it. I was also in the early stages of struggles with readers. I ordered a pair of cheap glasses from Zenni ($15 including priority shipping!) with the needed cylinder in the left eye, and +2.0 sphere in both eyes, assuming correct vision in the right after it got its new lens. I figured that would give me a good pair of readers, at least for starters. They were in daily use as soon as they arrived, and have been a big win. But what about driving? 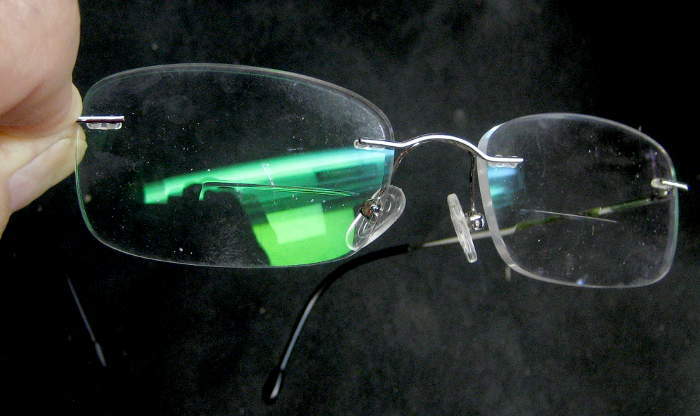 I ordered a single lens blank – plano, but with 1.25 cylinder to fix the astigmatism. 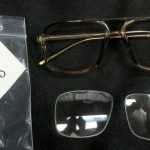 Errors at the vendor (eyeglasslens.com) delayed the order, but when it finally arrived, I had 2 things: first, the lens to make some driving glasses; and second, a good way to see how much the astigmatism correction helped (including the angle). I sketched the outline of the frame on the lens much as above, and again cut the lens down on the belt sander. It’s acrylic, and that went pretty fast (leaving a LOT of white swarf on the sander). A couple of iterations, plus grinding/filing the edges to a pointed cross section to fit in the groove in the frame, and I could put it in. Not perfect, but fully good enough, and hasn’t fallen out in many wearings. As for observing how much the astigmatism correction helps, the lens was a good tool. While I played with it in my hand as soon as I got it (duh! ), the best test was after it was mounted in the frame. In the car, I could look at distant lettering with/without the glasses for an excellent comparison. The bottom line for this one data point is that the 1.25D of cylinder correction makes not a huge improvement, but a clearly visible one. 6/11/18: This isn’t really a hack, unless you consider writing your own glasses prescriptions a hack. Readers are a real nuisance. Half-eyes on the bridge of my nose, readers that live on top of my head until needed, readers in pockets, shirt collars – none worked well all the time. (And I’m not about to wear them on a chain around my neck.) Let’s just get some bifocals I can wear all day and see if that works. Of course we restart late in the year after Foulkes fires up his lasers and fixes what needs fixing. But I need something stable until then. The latest refractions from Foulkes (bless his patient portal for making all visit docs available!) 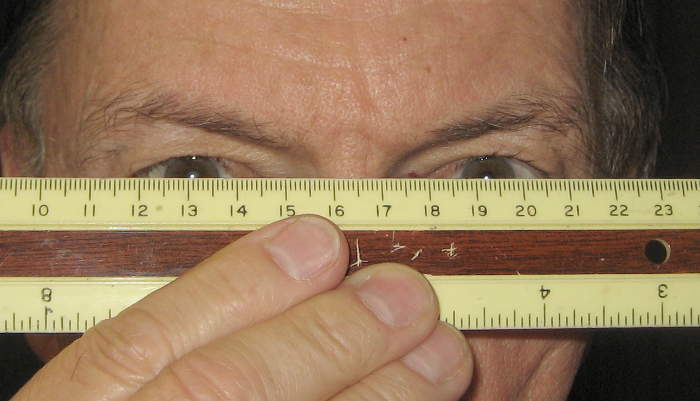 showed +0.5D sphere in both eyes, along with the 1.25D cyl in the left eye. 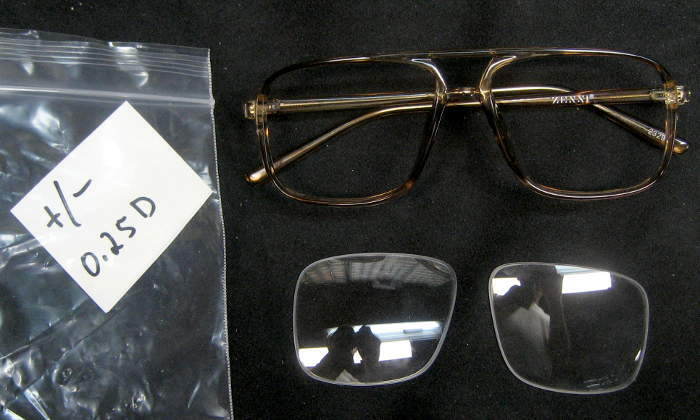 I had some +2.25 (hingeless, rimless) readers, but the old +2 Zennis seemed a little better. So I ordered new Zennis with +0.5 on top, and a 1.5 add to get back to the 2.0 the old Zennis demonstrated to be about right for near/reading. And of course the cylinder for the left eye. Those should make distance a little better, bring all the intermediate in a little, and of course provide readers always at the ready. (Might need to learn to be careful the add doesn’t cause me to fall down the stairs, tho.) $55 with priority shipping. Might get here before Kirkwood. Will update when they come. Zenni bifocal update 7/28/18: I’ve had these for just 10 days now, and they’re a great success. They’ve provided 2 bits of value – one unintentional. The big win is that by wearing them most all the time, I can always read (phone, papers, whatever) without having to search for readers. The best I’d come up with before was the frameless, hingeless +2.25 OTC readers that I wore on top of my head most of the time. I was starting to get used to those lightweights, but they’re not good for outside/breezy or even inside bending over, etc. At the cost of always wearing glasses, these completely avoid those downsides. In an interesting tradeoff win and data point, the +0.5 top part is not correct for distance. I’m noticeably better off with my one-lens “driving” glasses for driving and the like. That’s fine – the one-eyes live in the car. But that top part provides better intermediate vision – a definite, if small benefit for the distance to a lot of stuff in the house. That also makes the jump to the (lined) reader part less jarring. I suspect that’s a plus, though I’m not certain. The valuable insight I didn’t expect, however, is what it’s like to live a little nearsighted. That will be helpful in deciding how to direct Foulkes for my final Lasik. I’m considering asking for maybe 1.0-1.5D nearsighted. 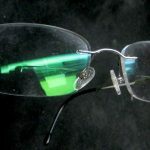 While that would absolutely mandate glasses for driving, it would make daily interactions easier. If it could bring my vision in enough to actually read without glasses, the tradeoff that distant things weren’t crisp would probably be worth it. Of course the Symfonys would still be doing their part in helping that. Hmm. I wonder if I should get some more Zenni cheapies in that range to let me live with the vision I’m planning to ask for. Single vision, maybe +1.25, with the cylinder, of course. The +2 Zennis are sort of like that, but arguably too strong. They’re great for reading and computer use (I’m wearing them as I type this). I guess the interesting and powerful idea is to get some cheap glasses to test out life with candidate vision correction. 8/6/18: I ordered some +1.5 (plus the astig correction) single vision throwaway testers from Zenni ($15.54 including expedited shipping!) before Kirkwood and have had them for a few days now. They’re blue just to be easy to identify. 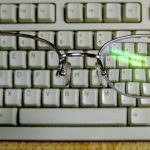 The goal was to see what it would be like to live with that correction (without glasses) as the result of asking for that from the LASIK. Very interesting. I can pretty much read with them, and as expected, the distant world is a little blurry. The experience is much like my old “computer” single vision glasses. I could probably live with that around the house (as I did before when I wore those glasses 95% of the time at home). And while I could no longer see leaves on the trees crisply through the window as I got out of bed (with no glasses) as I do now, I could read my phone. I’ll make that tradeoff happily. Yes, I can see “well enough” across the room. But that mild disconnect from the world being a little blurry is where the questions begin. I’ve gotten used to seeing pretty well across the room with the bifocals (and still being able to read well). 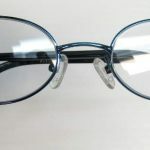 I wore the new (blue) single visions to the grocery store the other day, and while I could read product labels acceptably, the whole blurry disconnect from everything else made me wish I had my good old bifocals. That was an interesting surprise. Of course I could just keep my driving glasses on in cases like that, and look under them to read. Or have that planned LASIK outcome and just plan to wear glasses all the time: -1.5 on top, with a 1.5 or a little more add on the bottom. Progressives have worked well in the past, so those would be likely. I’d still have the option of no glasses for the computer, and I could still read the phone on the nightstand in bed with no glasses. 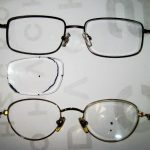 I suppose another option (since I’m going to have to wear glasses full-time anyway) would be to keep my about-perfect right eye, and just do LASIK on the left to fix the astigmatism, leaving it correct for distance. That would save me one LASIK surgery, give me the option of driving without glasses, and let me use OTC readers (or OTC plano/add bifocal readers). But I couldn’t read my phone without glasses. Hmm – I suppose as long as I had to do something to the left eye for the astigmatism, maybe have him set that at +1.5 or so, giving me one eye monovision for no-glasses reading. Hmm. (Update: He mentioned possibly using the less-invasive LRI rather than LASIK for the astig correction – which changes things a little.) 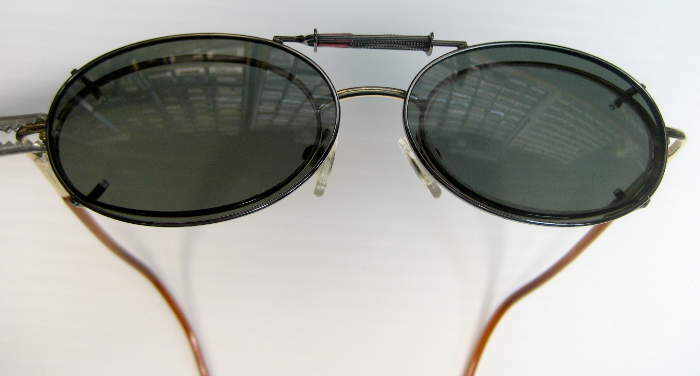 I wonder whether that difference would affect binocular vision/ depth perception with my +4 (+2.5OS/+4OD with this monovision) bench close-up glasses. We had discussed and discarded mono vision early in the consultation phase out of concern for just such discomfort with close-up glasses. I suppose one possibility would be to do that for the left eye and wait-and-see for the right. Anyway, this $15 investment has been a total win. I got the desired data point of whether +1.50 is just right or not. Another $15 to check out +1.75 might also be worth it. (I already have the +2.0s.) The surprise “I want my bifocals back” at the store was illuminating. I don’t know yet what I’ll end up deciding, but I’ll be able to make a MUCH more informed decision. Certainly much better than accepting the surgeon’s default recommendation of “Just fix ’em for distance!”. Update 8/7/18: Small new insight: If I have him do LASIK to make me 1.5D – heck, or 2.0D! 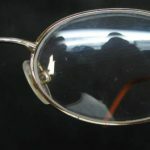 – nearsighted so I can read well in bed, the blurry world disconnect probably isn’t very relevant: If I expect to wear glasses (bifocal/progressive) full time anyway, the only time the blurry world would occur is in bed or in the shower until I put my glasses on. (Just like my pre-IOL uncorrected vision, but less extreme.) Then, whatever nearsightedness I choose for comfortable reading, the tops of my glasses will eliminate the fuzzy world, and the add will bring me back to good reading. So how nearsighted I choose to be without glasses really has very little other impact. Interesting. Update 8/9/18: A minor update on the blue single visions: I’ve pretty much stopped wearing them. They gave me the insights I wanted, so I’m back to my good old bifocals. I pretty much wear my (astig corrected) +2 single vision Zennis at the computer (for no sore neck). That would be like just taking my glasses off with the proposed +1.5 (or +2.0, toward which I’m increasingly leaning) post-LASIK outcome. And the bifocals the rest of the time. I’m mildly considering having another pair of bifocals (or possibly progressives) without the incorrect +0.5D my refractions have consistently reported. Those could truly be full time glasses, giving me everything from driving to reading, and providing a good taste of what that final arrangement would be like. On the technical point: What’s up with my refractions (including the most recent on 8/7/18) all showing I prefer +0.5 for distance? While driving, it’s completely clear (no pun) that I see more clearly at distance without that +0.5D correction. When I brought it up with Foulkes, he said it was because my pupils were constricted in daylight and thus didn’t need the correction. Sorry – doesn’t make sense to me. Constriction provides more depth of focus, sure – but the basic focus doesn’t change. And the same difference is seen at night. Troubling. Update 8/10/18: Not glasses related, but more of the post IOL story: Saw Dr George today. The film he saw last time over the CME was gone, and he’s not concerned about the remaining macular thickening if I’m OK with my vision. 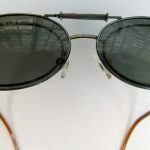 He recommended a laser procedure to create scarring to help reattach the vitreous to the retina (left eye only), possibly avoiding a tear and retinal detachment in later years. I agreed and he did the procedure on the spot. Uncomfortable, but presumably very worthwhile. Update 8/21/18: A couple of bits of news. One is that I just ordered some “full time” interim bifocals (Zenni, $55) that should work both providing readers in the house and be good for driving. It was a toss-up whether I should try out progressives from them (and for me), but went with bifocals for the wider reader area. I expect the final situation (post +2.0 LASIK) will be full time glasses much like these, and these should help me learn what that will be like. I went with frameless and hingeless to save a little weight (and since they’ll probably never be in a case!). The OTS +2.25 hingeless readers I tried to wear on top of my head seemed nice. The prescription runs into the other news. It was just like the hinged rimless bifocals I’ve been wearing every day, but +0.25 instead of 0.5 on top and +1.75 instead of 1.50 bottom. Really close, but I justify them to see what life will be like without the hassle of changing to driving glasses. What drove that prescription? Frustrated and annoyed that I couldn’t trust refractions from Foulkes (WTH!? ), I wanted a pair of test lenses with + and – 0.25D so I could test and tweak and find correct prescriptions. Having +0.5s as well as stronger readers, I figured these new lenses would cover what I needed. I could order from the place I got the 1.25D cyl blank, but at ~$35/ea that was too expensive. I called Zenni, but was told they couldn’t sell me just the lenses. Grumpf. So I ordered a pair of glasses with the cheapest ($6.95) frames with one “eye” at each prescription. I chose large frames to leave me with the maximum lens size. With cheapest shipping, they were about $12. Fine. The lenses popped out easily, and let me check out both my +0.5-on-top bifocals and my bare eyes. I’m now quite comfortable that the best distance prescription (until LASIK) for both eyes is sphere +0.25. I can see better with each naked eye (or the current driving glasses) with the +0.25, and better with each with the bifocals with the -0.25 lens. Twice great: Now I have a prescription I’m confident about (and ordered with) for the full-time glasses. But maybe more importantly, it looks like the refractions from Foulkes are 0.25D – not 0.5D – off. I can accept that much more easily. And now I think I can trust refractions from Foulkes by adding my +0.25D correction, and order future glasses based on that with good confidence. 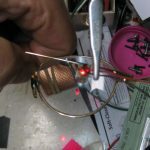 This entry was posted in Vision stuff and tagged hacking glasses, post cataract, Symfony, Technis, Zenni. Bookmark the permalink. That’s a great hack! Probably would have worked better if right side wasn’t progressive. I tried progressive once and hated them.